Every year we receive Cheti Chand Greeting from Dada Rochiram who is managing Sindhu Library in Ulhasnagar-1. 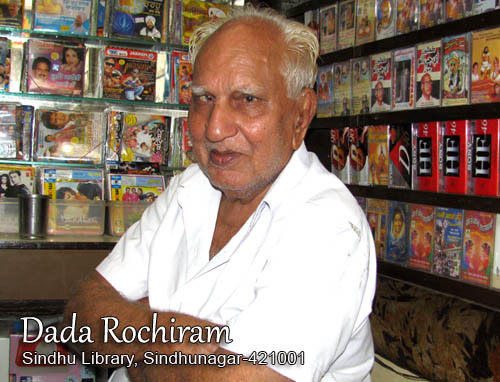 Dada Rochiram is Savior of Sindhi culture and language who never leaves any opportunity to promote Sindhi. Look at the Envelope , At least title is repeated in Sindhi language. From Sindhu Library Address is stamped in Sindhi and English. And he ensures there is Bhagat Kanwarram Stamp on the envelope. 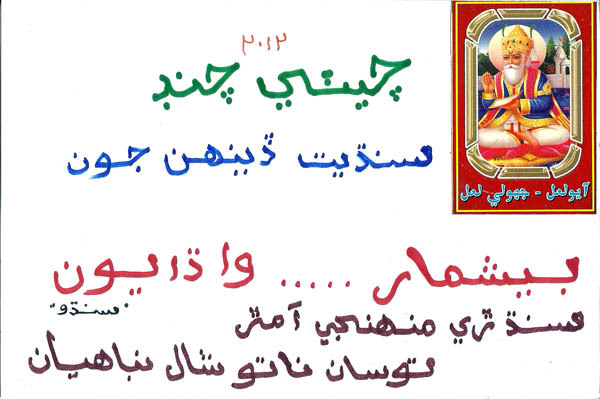 This is complete Sindhi Card. 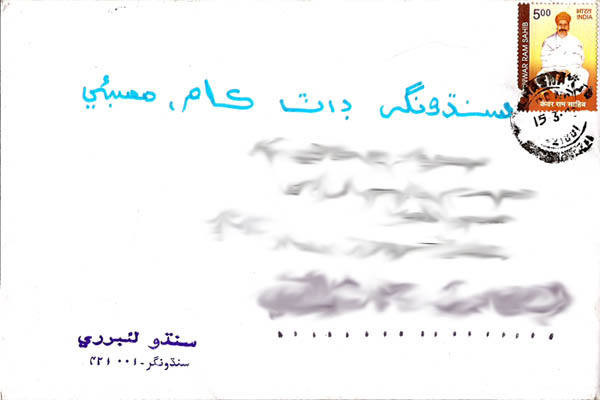 When this card travels the post offices across the districts and states, everyone on the way is assured that Sindhi Language exists. All his cards are hand made in Sindhi Language even though his eye sight is week and he is into eighties. For Ulhasnagar he travels on his own for hand delivery, climbs building stairs where no lifts are available. 100 Salutes to him who has kept fire burning for mother tongue even in this age. CHETI CHAND JI KAROR KAROR VADHAIYU….